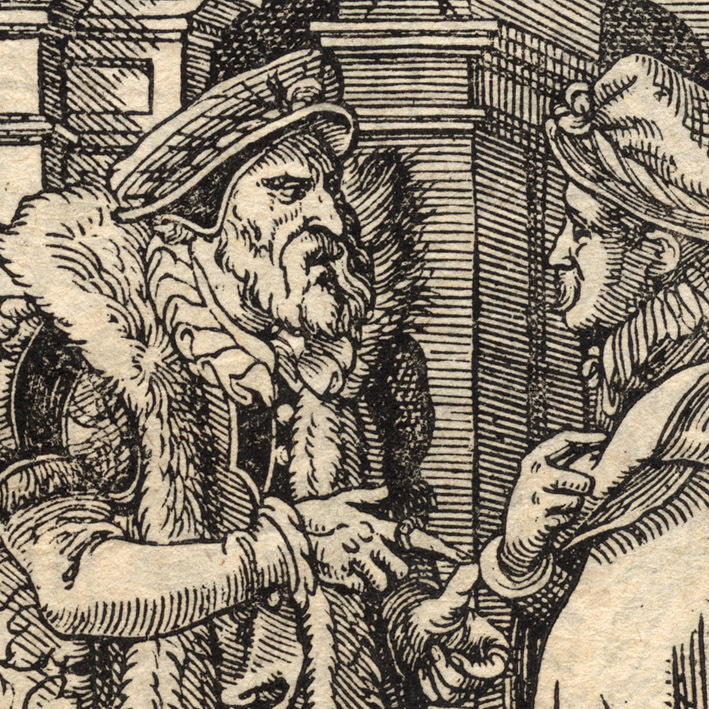 Double-sided leaf with woodcut illustrations from “Kunstbüchlein”, published in Frankfurt am Main by Sigmund Feierabend (1528–90) and printed by Johann Spiess. 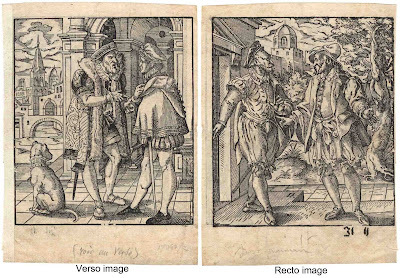 (left image/verso) “Two men in conversation on a doorstep with a dog”, 1580. 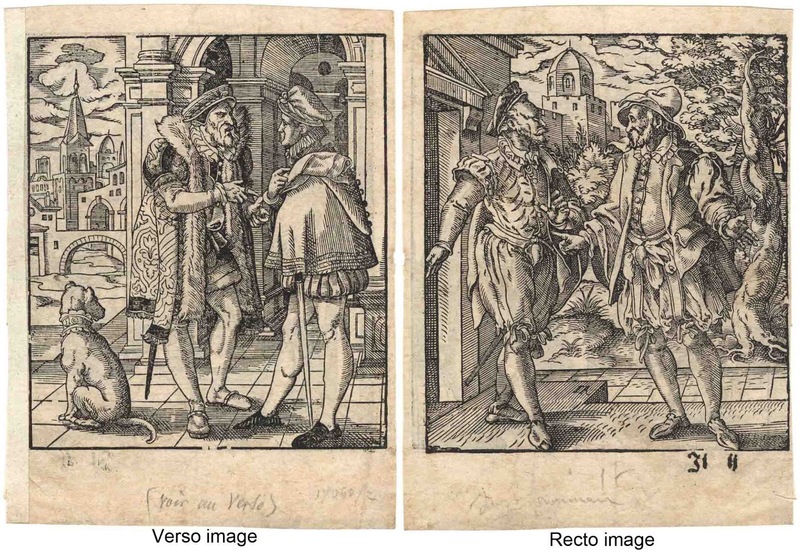 (right image/recto) “Two men in conversation on a doorstep”, 1580. New Hollstein (German) VII.169.142 (Jost Amman). Condition: the leaf is double-sided with crisp impressions (i.e. there is very little wear to the plate) and in very good condition for its age (1580). 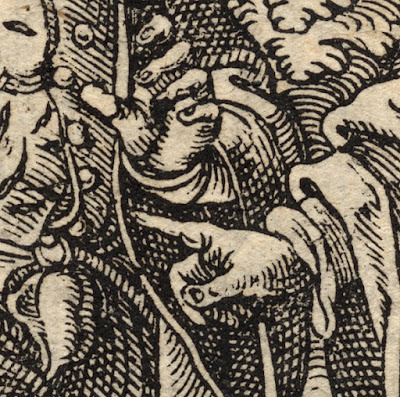 Nevertheless there are indistinct pencil notations on both sides in the lower margins and the recto image has ink notations by an old hand. 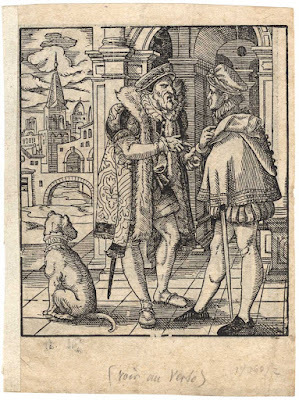 I am selling this original double-sided leaf with superb, well-inked woodcut impressions of museum quality from the early 16th century for the total cost of only AU$108 (currently US$77.83/EUR69.49/GBP53.28 at the time of posting this leaf) including postage and handling to anywhere in the world. If you are interested in purchasing double-sided leaf, please contact me (oz_jim@printsandprinciples.com) and I will send you a PayPal invoice to make the payment easy. 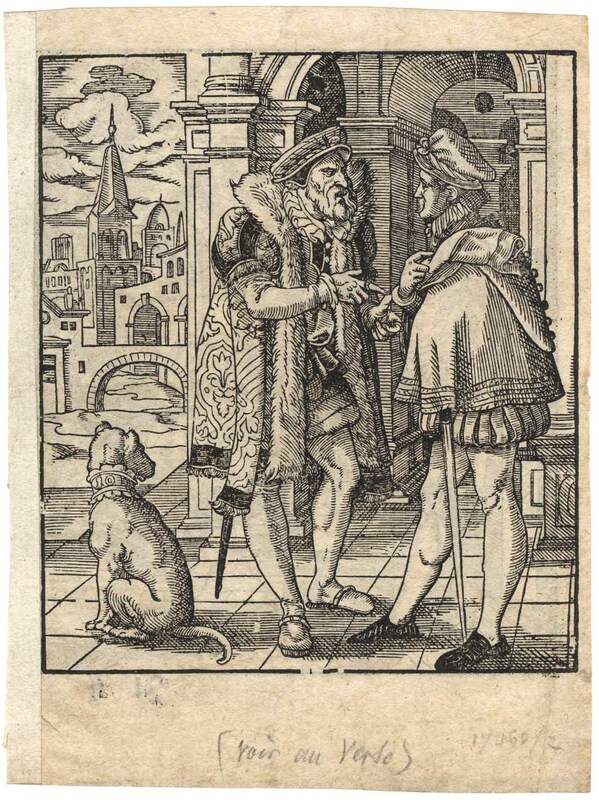 Metaphorically, Jost Amman followed in the footsteps of Nuremberg’s most prolific printmaker of the 16th century, Virgil Solis (1514–62), to become one of the major printmakers of his time. 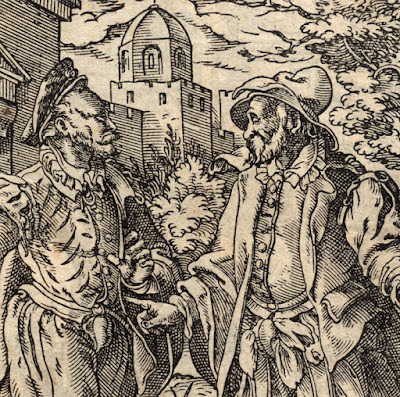 In a sense Amman’s discipline to be so productive is not surprising seeing that he was one of Solis’ assistants, but he also followed Solis in terms of making life difficult for chaps like me to be confident with attributing prints to him. The reason that I mention this personal dilemma is that Solis’ monogram—an overlaid “V” and “S” (see the next set of prints that I will be posting)—doesn’t signify necessarily that the artist designed or even executed the print. All it signifies is that the print originated from Solis’ workshop. 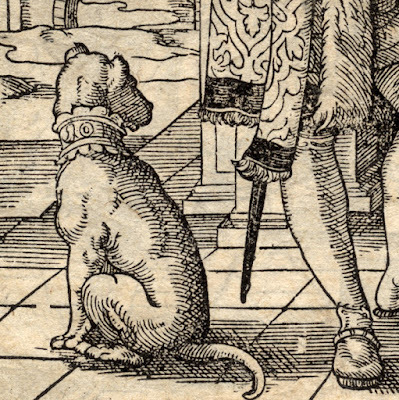 In the case of Amman, he not only followed Solis’ idea of using a double letter monogram, such as the “IA” inscribed on the floor of the recto image—the image without the dog—but he also used different ways of entwining the letters, employed variations to the letters employed in the monogram (viz. A; AI; IA; IAF; IAG; IAPGVZ; IAR; IAT; IAVZ) and his monogram is used in combination with no fewer than 51 monograms of other artists. Leaving aside the idea of Amman following the footsteps of his master, there is a noticeable stylistic gap separating Solis and Amman. Amman gives a degree of plasticity and flow to his portrayed figures that makes Solis’ figures appear awkward and stiff by comparison. 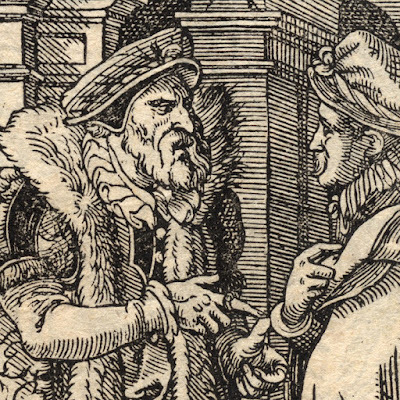 Note, for instance, the expression of natural body language that Amman presents and the discipline in his meaningful use of contour marks to render his subjects in three-dimensions. Regarding Amman’s use of contours, I adore his treatment of the dog's form in the verso image … just look at the dog’s armpit! 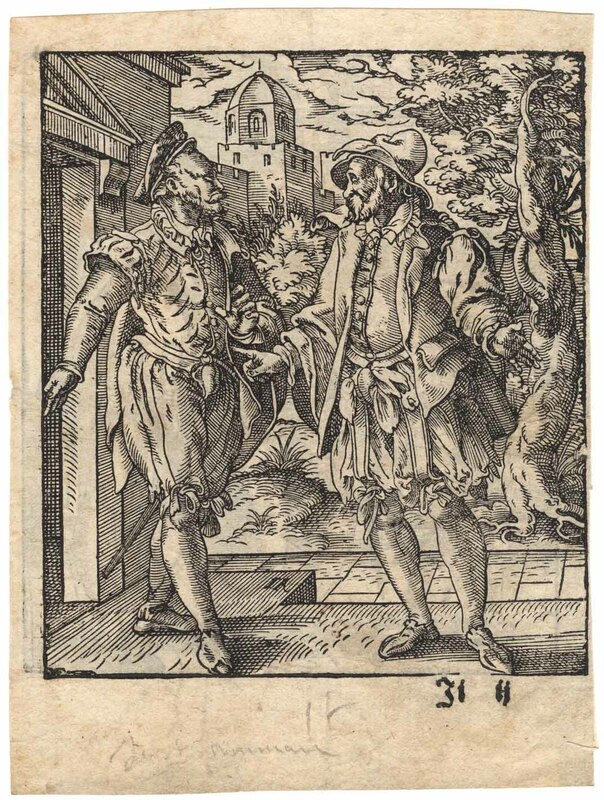 I hadn't realised that I have both volumes of "The Illustrated Bartsch" (catalogue raisonné) devoted to the prints of Jost Amman (Volume 20: Parts 1 & 2). I discovered that what I thought were "notations by an early hand" are actually a part of the print! Wow! 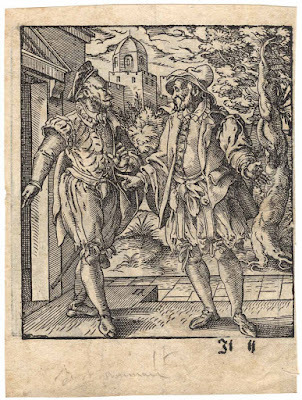 The Bartsch title for the right/verso image is: "A Dog Waits While Two Men Converse" Bartsch 4.252 (368) and the title for the left/recto image is: "Two Men in Conversation on a Doorstep" Bartsch 4.251 (368). If anyone is interested in purchasing my collection of The Illustrated Bartsch (71 volumes), I'm selling them for AU$200 each plus shipping. 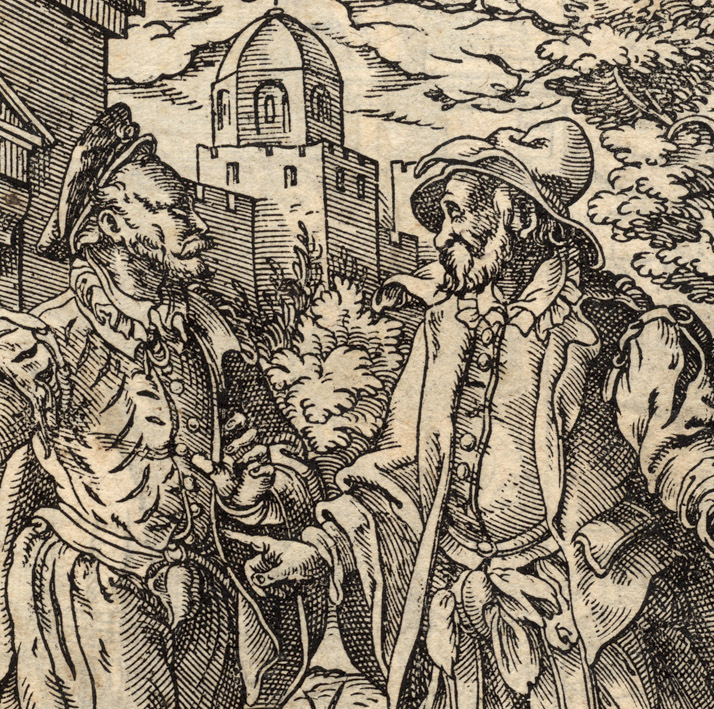 I realise that such a collection is only of interest to specialists, but having a catalogue raisonné of each of the early printmakers is the ultimate reference base anyone could have.